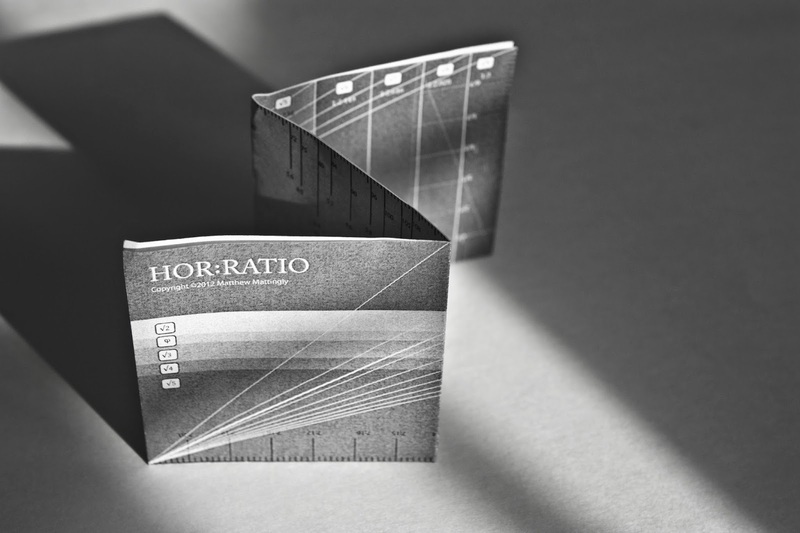 Hor:ratio is a pocket reference and proportional protractor for artists, designers, art historians, or anyone interested in systems of proportion. It enables the creation, scaling and measurement of rectangular ratios, making it easy to experiment with proportional combinations for new works or to test hypotheses about the composition of existing works. Throughout human history, artists, designers and architects have been guided by various systems of proportion. Sometimes these systems were mathematically rigorous, strictly adhered to and thought to be divinely inspired. In other times they have been employed more loosely as aids to aesthetically pleasing designs. Whether adopted as a tool of creation or analysis, they are fascinating in their own right. Hor:ratio was originally concieved as a learning aid for my own studies; as it developed I thought it might be of interest to others. Please download, experiment, play, work, and respond on this site. Hor:ratio and its accompanying documentation are still works in progress, and your comments and suggestions are welcome. Hor:ratio by Matthew D. Mattingly is licensed under a Creative Commons Attribution-NonCommercial-ShareAlike 3.0 Unported License. Wow, Matt this is so cool!